Will Kashmiris win freedom through armed struggle? The fundamental element in any nation's struggle is unity. Keeping in mind the thematic and objective circumstances of a given nation's struggle, it must have a strong, organised and ideologically mature organisation to come to grips with the serious problems that are likely to arise while the struggle is being carried to its conclusion. In particular when a nation decides to achieve freedom through the gun, it must organise a major chunk of the nation before the gun is introduced. Before the first round is fired, the war strategy has to be drawn which also means to take into consideration the possible reaction of circumstances and the enemy. Keeping in sight the war strategy, occasional modification in the planning of the struggle is also of much importance. Usually in an armed liberation movement, the losses of the oppressor are less than those of the freedom fighting nation. Therefore the freedom fighting organisation has also to plan for freedom fighting movement and also to take into its purview the planning for the development of the orphaned culture. The subsistence for the family of the martyred people and related problems have to be taken care of; families of freedom fighters taken captive by the enemy also need organisation's attention; freedom fighting prisoners need legal assistance besides psychological support. The prisoners have to be occasionally visited by their relatives and friends and ways have to be found how to do that. But the essential requirement is that the members of freedom organisation should be highly disciplined. This is so because the freedom fighter appears as liberator in comparison to the oppressor. A freedom fighter has to subject himself and other members of his organisation to strict accountability at every stage in order to maintain their high image in the eyes of the community. Through that image, the spirit of struggle in the nation is constantly generated involving the entire people till the final goal is achieved. A fine example of these conditionalities is to be found in the Vietnam war in our times. For over thirty-six years, the Vietnamese nation fought first against Japanese imperialism , then the French and lastly the American imperialism and won their freedom. Algeria, Namibia and some other African nations won their freedom through armed struggle. But it has to be remembered that wherever in the world freedom was won through armed struggle, an organised and disciplined organisation was in the forefront of that struggle. Wherever the struggle was beset with chaos and lack of direction, numerous factions usually antagonistic to one another came into being. For lack of national unity, struggle of many nations was reduced to nothing more than a few sordid stories of distressed orphans, and raped and molested modesties. Two years ago, I had drawn the attention of the people to some subtle aspects of an armed struggle, Pakistan's interests in AK, India's reaction and the armed struggle taking a wrong path. Alas, persons becoming 'leaders' overnight on the strength of guns ignored the national cause. In order to protect their leadership, they did not pay heed to my suggestions. The reward they gave me for my long sacrifices, unrelenting struggle, exile and for being a colleague of our great leader Maqbool Bhat is there before my nation. For last twenty-two years, I have engaged myself in the struggle for the freedom of Kashmiri nation for which I have love and respect. The focal point in my struggle is "what can I give to my nation" I have never even thought of what the nation has given to me. Today I can see under the same emotion that the national liberation struggle is heading towards disastrous and destructive end. Motivated by my nationalist sentiment, I would like to make in-depth analysis of the armed struggle for the cool consideration of conscientious sections of our nation. In doing so I also make a fervent appeal on that basis for the redemption of Kashmiri nation and its restoration to honour and dignity. I wish that Kashmiri nation keeps in view this analysis and makes a resolve to shed emotional approach. They should take a decision keeping an eye on the hapless faces of innocent orphans, the blood drenched bodies of our martyrs and shredded modesty of our womenfolk. The simple question they have to ask themselves is this "Can we win freedom and honour through the ongoing armed struggle?" If the answer is a no, then instead of dragging the entire nation to the brink of destruction, a new path to be found among them; discipline and control is nowhere in sight and there exists no single authoritative command. 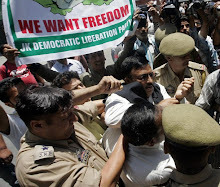 If Kashmir militancy movement is called an uncontrolled movement, it is not far from the truth. Planning and tactics have no role whatsoever and everybody acts according to his sweet will. Whosoever gets hold of a gun, considers himself an embodiment of wisdom and all powerful". This was followed by the letter of Salim Wani, the Chief Commander of Al-Mustafa Liberation Fighters published in newspapers appearing from Kashmir. Some of its excerpts are: " The entire nation has given full support to the freedom movement. But we have to see lest we are taking undue advantage of these sacrifices. What is happening with those who sacrificed their lives, property and honour when we show them the gun and threaten them. How can those be called freedom fighters who threaten their own people with guns? We have taken up the gun to deliver the nation from slavery and not to make the people our slaves at the point of the gun. Unfortunately Kashmiris have always been driven like dumb cattle. They have never been taught the lesson of self-respect. At one time they were driven by the Maharaja and at the other time by the Congress or the National Conference. Militant organizations, too, did not spare them (that treatment). These militant groups have left no stone unturned to put people to suffering. The people are told that if you do this, you will be killed and if you do not do that, your legs will be broken." Salim Wani writes further," Perhaps one may escape from the clutches of Indian troops but if he fell in our hands , he meets a horrible death. We are not prepared to make any concession to the 'informers'. In our book of law, an informer's punishment is death. But this is the first ever example in the world where a freedom fighter becomes an informer. After our arrest by the security forces, we are seen within 24 hours sitting in the bunkers of these forces identifying people. Did any one among us swallow poison when captured by the security forces." In an article entitled 'Aye sharmanda hojaen ' ( Let us feel ashamed) in three instalments, Javed Kotwal of Islamabad, Kashmir asks some questions after making an analysis of these circumstances. He writes, " We wish that gun wielding youth were farsighted and had thought for a while how the difficulties of common people are exacerbated. Not to speak of adversaries, even ordinary people will distance themselves from the mujahideen and their movement. A day will come when not to speak of them even the genuine mujahideen will face the hatred and disparagement at peoples' level. At that time people will not ask for freedom from India, they will ask for fredom from guns. They will ask for nothing but freedom from freedom fighters. I wish God does not show us that day." The weekly Chattan of Kashmir which has a wide circulation, writes under the caption Kashmir situation." Is tarz-e taghaful ka anjaam kya hoga". " If this nation stands dejected and dishevelled today, the reason is not the oppression and tyranny of India. The reason is that behaviour and action of the mujahideen of the nation which have thrown the entire Kashmiri nation into a state of chaos and confusion. Nobody had imagined that the war for freedom will adopt such norms that the gun taken up to throw India out of Kashmir will be used against our own people; school and college buildings will be burnt; Indian security forces will be provided ample pretext to let loose their oppressive machine on innocent people in densely populated localities; throats of our own people will be slit on alleged charges of being informers and traitors. Nobody had imagined that one trying to give sincere advice for collective thinking and improvement of situation would not be heeded. What is more, such a person is branded as an Indian agent spreading demoralisation thus imposing a ban on his national duty and sincerity". The writer goes on to say," The resistance movement in Kashmir is certainly a full-fledged movement and each citizen of the motherland is deeply engrossed in it. But the traditional psyche of this nation has not still changed. This psyche is confronted with overgrown emotionalism and blind following owing to which mistakes made at crucial times have not been accounted for not to speak of correcting them. For half a century, Shiekh Muhammad Abdullah loomed large on the political scene of Kashmir. He committed some serious mistakes but the history stands witness to the fact that the entire Kashmiri nation followed him like dumb driven cattle. Till the last day of his life nobody had the courage to ask him to answer the blunders he had committed. It is now two years that Kashmiris have been fighting a bloody war. But the fact remains that the fundamental character and traditional psyche of this This gives an idea of the direction which the movement has taken. I had, from the very outset, pointed out the wrong elements surfacing or made to surface in the movement. Every Kashmiri should remember that as a result of the enactment of law in 1953 by Shiekh Muhammad Abdullah which did away with feudalism in Kashmir, millions of peasants were liberated from the feudal slavery overnight. They became the owners of land. This was a time when elimination of feudalism was not even contemplated in India. As far as Pakistan is concerned, those who claim to have brought Islamic system, have not till date imposed agricultural tax on landlords leave alone eradication of feudalism. In that country, life and honour of the farm labourers working on the estates of feudal lords is also considered the property of their masters. Shiekh Muhammad Abdullah was instrumental in making millions of Kashmiri peasants owners of land that fed their families. The same Shiekh Abdullah has not been given due respect by his compatriots to the extent that people even ventured to vandalise his burial place ( though speaking ill of a deceased person is disallowed in Islam and God alone is the judge of the deeds of the dead). Those who brought Kashmiris untold suffering by thrusting gun culture on them with the result that lives of thousands of freedom loving young, old, children, and women came to be annihilated and thousands of respectable mothers and sisters subjected to humiliation, should not expect that Kashmiri nation will spare them especially when despite all this saga of tragedy freedom is nowhere in sight. The Kashmiris did not spare Shiekh Abdullah. Will they spare those who brought them to the brink of destruction? This happened when the entire nation was party to the actions of Shiekh Abdullah. When he signed the Delhi Accord in 1975, more than 1.2 million people came out on streets of Srinagar to receive him. On his death, the second largest funeral procession after that of President Nasser of Egypt, was that of the Shiekh. The gun has not brought freedom to Kashmiri nation nor is there any sign of winning it in distant future. But what the people have met with is economic destruction. Thousands are languishing in prison houses and interrogation camps. Well, all these sufferings would not have been a high price if only the destination to be arrived at through the instrumentality of the gun were in sight. 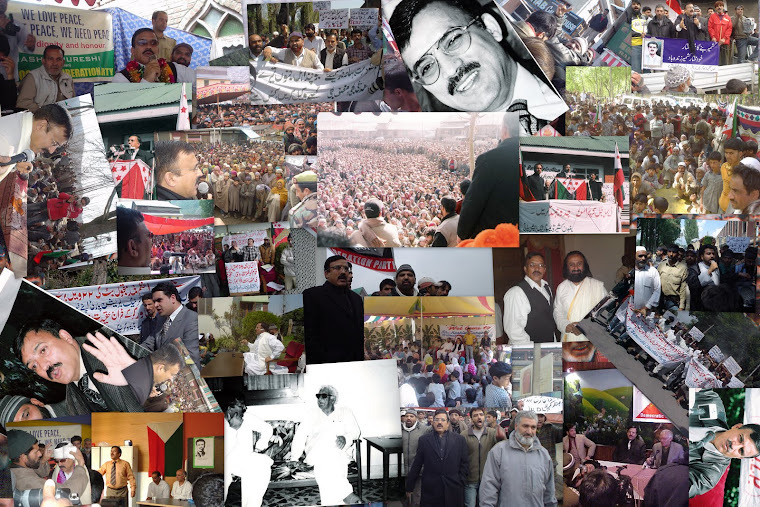 If the Kashmiris had forged ideological consensus while fighting the battle, if 124 armed groups had welded themselves into one well organised and coordinated group with cast iron discipline, and more especially if the thinking and approach of the leaders of armed movement ( barring a few of them) had not been subjected to the diktat of others and if external forces were sincerely in favour of Kashmiris in their armed struggle, the results would have been different than what we find them today. We should not forget that till 1970 or a little later, barring a few years, the then existing cold war syndrome had a bearing on all armed liberation movements wherever these surfaced in the world resulting either in achieving liberation or only in a stalemate. In the communist -capitalist lock-horn, wherever the US could harm the interests of Soviet Russia, she and her western allies flooded the region with arms and advisers. Likewise, wherever the Soviet Union found she could harm the interests of the western bloc, she did not hesitate to put everything at stake. For example in order to seriously damage the interests of the US in Vietnam war, Soviet Union, China and the communist bloc gave practical support to Vietnam. Prior to that, China had physically taken part in the Korean war. When the US supported Israel, Russia stood behind the Arabs. She supplied them arms and her advisers remained based in the Middle East. In fact Jamal Abdun Nasser almost held Yasser Arafat by his finger tip and took him to Moscow. It was as a result of Soviet Union's outright and practical support that PLO became a formidable organization. Likewise, the US and the Soviet Union vied with one another in pitting the people in Africa against one another providing support to their proteges. When the US found an opportunity of avenging her defeat in Vietnam, she equipped anti-Russian Afghan mujahideen with most modern weapons and billions of dollars. These instances are cited to substantiate the argument that hitherto in all national liberation movements or regional conflicts, cold war syndrome had a significant role to play. If this cold war syndrome had been there at the time of Iraq - Kuwait clash, and Russian position had not changed, then there would have been only two possibilities. Either there would have been no war at all against Iraq in the Middle East or that the threat of a world war would have become real. community could not be changed. If yesterday this nation was overawed by some Shiekh It has also to be noted that no national liberation war in any part of the world has ever been fought with the ideology of accession to another country. A national liberation war aims at complete freedom so that international community extends its support. Vietnam received full support from her friends but not for the objective of acceding either to Russia or China. The US and Western countries lent enormous support to Afghans but nobody supplied arms to the Afghan mujahids on condition that they would, at the end of the day, accede either the US or any European country. Palestine is part of Arab territory and Arab nation. No Arab country extended support to Palestine on condition that it gets integrated into any of the supporting Arab countries. Moreover, it is unavoidable for a national liberation struggle that it endeavours to establish an independent and sovereign state. Then alone can the world opinion be smoothed in its favour. A nation or a major chunk of it aspiring to accede to a neighbouring country should not expect world opinion to take care of its interests. As we intend to reflect on armed struggle in Kashmir, it is necessary that in order to sustain that type of struggle, there should be assured perennial flow of arms for the freedom fighters.. There should be a discipline and coordinated organization which can impose rules and regulation on its ranks precisely in a manner in which a regular army does. In order to bring the armed struggle to successful completion, protected training centres and the fighting force should be under the control of the central organization. Above all support of world opinion should go in its favour in any case. If that support is not in full measure, it should at least be to the extent that the world thinks your struggle is justified. On international plane, American and Russian interests do not clash in Kashmir. Naturally neither of the two is prepared to extend practical help to us in our struggle. Western countries do not find it in their interest to separate Kashmir from India. On the other hand, the US and the European countries today find large business interests in India. Holland alone receives thousands of billions rupees to clean river Ganga alone. At the same time the question is whether the US and the Western countries find any of their interests realised by Kashmir's accession to Pakistan.. (By way of small digression, it may be said that in the case of Afghan-Russian war, Pakistani rulers proved themselves to be more short-sighted than the Egyptians who had supported Americans against Iraq in the Gulf war. In return, they had managed waiving off the loan of ten million dollars. Pakistani rulers, instead of getting loans waived, managed to obtain on individual level salaries from CIA). Countries of Russian bloc supported Indian stand. World opinion has a good impression of India by virtue of her being a democratic state. Even our big neighbour, China, too does not see any interest in supporting the Kashmiri cause. Reforms are being introduced in China and for a long time China's policy has been not to get entangled in such disputes outside its borders as may adversely influence her domestic interests and her foreign policy. China is no more India's enemy. Moreover, China , too, has grabbed a considerable chunk of Kashmir territory. Thus, in final analysis, only Pakistan comes to our help but with her own conditions, viz. accession to Pakistan. Paragraph 7, item 2 of the Interim Constitution given by Pakistan to AK states: " No person or political party in 'Azad Kashmir' shall be permitted to propagate against or take part in activities prejudicial or detrimental to the ideology of the state's accession to Pakistan". In connection with assistance of Pakistan to Kashmir struggle, it has to be clarified that she would want to continue the war in Kashmir as long as protection of her interests is ensured.. This is the reason why Pakistani military intelligence extended help to Liberation Front in the initial stages. As a result, bomb attack on parading Indian troops was made by Iqbal Qureshi, Altaf Qureshi, Hamid Laleh and others on 15 August 1983, the Republic Day of India. This attack triggered off the armed struggle by the Liberation Front in Kashmir. While the Liberation Front had embarked on this adventure, Jamaat-e-Islami happened to be very much present in the State Legislative Assembly after taking the oath of allegiance to the Indian Constitution. This party had also been taking part in the Parliamentary elections. Since ISI extended its support to the Liberation Front in initial stages, the blunder on the part of Liberation Front leadership was that it did not accept this assistance from ISI on its own terms. When ISI found Muhammad Abdullah timid enough to criticise him for his blunders, today it is intimidated by its new leaders." What did the aforesaid chairman want to convey? He meant to say that at first supply arms and ammunition to the people. When they become leaders of different individual groups for personal aggrandisement, then they be told to give up these pursuits and re-group under the banner of one disciplined organization. This then is the perception of guerrilla fighters fighting a national liberation war in Kashmir. In short Pakistan fully exploited Liberation Front to realise its objectives and then abandoned it and found its own people to safeguard its interests. Amusingly, ISI did not allow even those pro-Pak groups to unite and saw to it that they functioned under the banners of different parties. It was only to ensure that in case of changing loyalties, ISI was not left isolated. Liberation Front was not only denied financial assistance by the ISI, the organization's ideology also was publicised as Indian's alternative plan. In this way the media was antagonised against the Front. Through its sponsored groups, Liberation Front activists were subjected to armed assaults. Pseudo-Islamists, known for exploiting religion for personal aggrandisement were goaded into issuing decrees (fetwa) that independent Kashmir was against Islamic system. Amusingly these so-called protagonists of Islam had been swearing by Indian constitution till yesterday. And today, these people functioning at the behest of Subedars, Captains and Majors of ISI , are trying to sideline the freedom fighters from their 35 - year old struggle by issuing Islamic religious decrees against them. Pakistan is extending support inside Kashmir only for her vested interests. By giving religious colour to the national liberation struggle, Pakistan is voluntarily depriving Kashmir's national struggle from the support of freedom loving communities in the world. Not to speak of other countries, even the Islamic states have not openly supported Pakistan's stand on Kashmir. In drumming up "Islamic brotherhood relationship" these Islamic countries offered billions of dollars to the US and other Western countries for perpetrating genocide in Iraq at a time when Kashmir was faced with bloodshed and destruction. Most of the 'Islamic countries' speak the language which the US would like them to speak. As such, they could neither come to the help of Kashmiris nor could openly endorse Pakistan's policy in Kashmir. It is obvious that for last two years and half, none except Pakistan has been helping the armed struggle in Kashmir. And Pakistan does not do so for the love of Kashmiris; she has her own axe to grind. On the aspect of the need for a disciplined organization to carry the armed struggle to a successful conclusion, I need not go into details. Kashmiri nation groaning under pain and suffering knows that there are nearly 24 organizations in Kashmir claiming to be fighting the liberation war. Each organizations considers itself more honest and more committed than others though most of them are unaware of an element called discipline. The third element necessary a to sustain an armed conflict is the need to establish training centres from which trained personnel regularly fill the ranks of freedom fighters. Unfortunately, there are no protected training centres for the freedom fighters in the valley. Now it is an open secret that in order to control the Kashmir liberation movement, armed Kashmiri groups are sent across the border to Muzaffarabad or the tribal areas of Afghanistan to receive training which, of course, is only superficial. When these young people begin to cross J&K border and are challenged by the trained Indian security forces, they are unnerved by the heavy fire and moving in groups of 50, 80 and 90, fall to the bullets on the border. They are imparted a bare one or two weeks' training. These young people are bubbling with freedom spirit. That spirit induces them to go away from their brothers, sisters and parents, from the comforts of their homes and traverse difficult mountains only to become fodder for the guns of Indian security forces. When the survivors reach the training camps in AK, the treatment meted out to these young boys is an eye opener for those who consider accession to Pakistan an article of faith out of share emotion and blind following. ( A few months ago two young Kashmiris belonging to Srinagar were killed in Muzaffarabad because of political intrigues of local people). Since youth from across the border now no more come for receiving training in the centres , trained man power needed to sustain the armed struggle is not available. Had the Kashmiris been given training in real guerrilla warfare, they would not engage Indian military power in towns and villages. Instead they would fight in forests, on mountains and at desolate places. 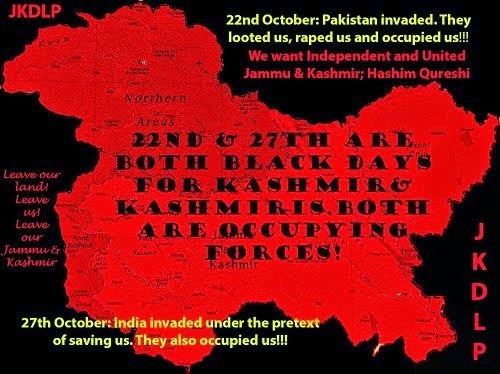 They would have forced Indian forces to get scattered and dispersed all over Kashmir. Thus instead of getting martyred in fighting the Indian troops in forests, Kashmiri armed youth were killed while crossing the border or while trying to reach the towns. Why then do the so-called leaders and pioneers of armed struggle hide these realities for their petty interests? It is because of these concealments and conspiracies that the Kashmiri nation instead of making so many sacrifices has not been able to reach even the first destination of it objectives. It has not been able to register practical support for its movement, its struggle and its political goals. Providing arms and ammunition and medicines or resettling of uprooted people from their homes is a distant thing, even moral support to the movement on international plane is not forthcoming. There is no programme of caring for the orphaned children or providing them education; nobody cares for the family of the martyred persons..
Again this is the only armed struggle in the world which has no plan for the victims of the struggle, for people deprived of their means of subsistence and for those languishing in hunger and disease. The question is will the nation continue the struggle for a long period after its has been brought to the brink of economic disaster and involved in the armed movement at the point of gun? The entire economy of the community has been taken hostage. Tourist industry has almost disappeared and no income is generated on that count. Industries have been shut down; cottage and small scale industries find no customers for their products. The plight of the daily wager who is to feed his family is painful to explain. Have the leaders of armed struggle ever thought of these things? Have they ever thought that so far India has not suffered any serious loss. There may be some losses of lives among Indian security forces or troops but our losses are tenfold. We have not been able to inflict any serious loss on Indian economy because the clashes do not take place in India but in the streets and houses of Kashmir and our productive potential has more or less been fully exhausted. As against Indian security forces, our youth has received only nominal training in arms and warfare. It is one thing to strike at security forces from vantage points in densely populated streets and lanes and then hide in some residential quarter and another thing to become a a true guerrilla fighter to take on the enemy far away from towns. We have made a sacrifice of nearly twenty thousand youth but in spite of that we have not been able to register even five per cent support of world opinion. Not to speak of world opinion or solid support from Islamic countries, we have not been able to win even moral support from international community. It needs no reiteration that no national liberation struggle ever achieves its goal without the support of world opinion. Just consider the trend of the world opinion. Only a few months back International Monetary Fund approved four hundred billion pounds loan package for India. On political plane, the US excluded India from Pressler Amendment enabling her to continue to receive loans from international bodies. All aid was stopped to Pakistan under the same amendment. The US ambassador in Pakistan openly said that no doubt Kashmiris are dealt with unfairly in Kashmir but Pakistan is adding fuel to fire by providing Kashmiri youth arms and ammunition and that the US did not approve it. The question is why has India been able to convince the world that Pakistan, by supplying arms and ammunition to fundamentalist Kashmiri Muslims, is trying to annex the predominantly Muslim Kashmir by pitting Kashmiris against India? India has been able to convince the world that the war in Kashmir is being fought by fundamentalist Muslims and all non-Muslims have been extirpated from the valley and forced to live in camps in Jammu and Delhi. India has been able to say that she is faced with terrorism in Kashmir and Kashmiri girls are being kidnapped (the example of Naheed Soz is being cited). India has kept the Islamic countries at a distance from Kashmir's national liberation struggle by bringing home to them that more than 18 crores of Muslims live in India. They argue that a if Kashmir is to be separated from India and given to Pakistan, it will endanger the future of 18 crores of Indian Muslims. Islamic countries have taken note of this argument. Islamic countries and other countries in the world including human rights organizations may have condemned atrocities by the Indian security forces on civilian population in Kashmir, but nobody has openly supported the right of self determination of Kashmiris. Nobody has interpreted Kashmir question in the light of the struggle of Kashmiris for freedom. All that they have been doing is to dole out pieces of advice for India and Pakistan to resolve the dispute under Shimla Agreement. It is also true that the world is no more prepared to accept any struggle if waged through the use of arms whether the struggle is genuine of spurious. In other words it may be said that the balance of power goes against us, the Kashmiris, because the interests of the world community are not in Kashmir as these were in Kuwait, for example. As such the world powers call our conditional armed struggle (conditional because of its undertones of accession to Pakistan) only a manifestation of terrorism. As against this inhuman oppression unleashed by Indian forces is given the name of maintenance of law and order. When we have accepted the ideology of accession to Pakistan and have launched armed struggle for the realisation of that goal, we have not been able to win public opinion. By declaring accession to Pakistan as the goal of the movement, the world has been given the message that the entire armed uprising has been engineered by Pakistan. India, therefore, projected herself as a victim of terrorism and fundamentalism threatening her democratic system. Armed groups in Kashmir threatened the forces that supported India's stand, no doubt not a correct one, and forced them to leave Kashmir. This proved that fundamentalism had been unleashed in Kashmir. As against all this, Pakistan presented Kashmir question at international level as a dispute between her and India. I am loath to say anything against any group in Kashmir. But to me, Kashmiri nation is more important and superior to any group or party. As a committed son of the soil, I cannot see my nation drawn to the brink of disaster. Even in earlier days, I have been pointing out the wrong trends developing in the movement. But my articles based on facts and sound arguments could not be published sometimes because of the threats handed over to the publishers and at other times because of criticising my 22- year old freedom struggle for the 'crime' of speaking the truth. My freedom struggle which I launched under the leadership of Shaheed Maqbul Bhat is as old as the age of the youngsters now leading the armed movement. I had the honour of founding the Liberation Front in AK, Pakistan and structuring it. My brother Iqbal Qureshi and Ashraf Qureshi's brother Altaf Qureshi had founded the Liberation Front as early 1983 in Srinagar. 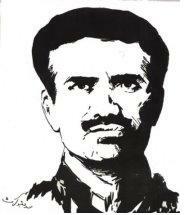 I must also inform my readers that I was among the founders of armed struggle in Kashmir. But Let me say in all honesty that we had not even dreamed of the type of armed struggle that has been launched now. We had never dreamed of allowing anybody to play with the blood and sacrifices of Kashmiri youth for their personal aggrandisement or for pleasing their external masters and serving their interests. Therefore it is necessary that we, as a nation, analyse our struggle for our existence and the goals we have set for ourselves. I, therefore, invite the attention of my readers. I have come to the conclusion that above mentioned realities, reactions and experiences teach us that we can achieve our freedom not through armed struggle but through peaceful civil disobedience. A physician changes his line of treatment if the patient does not respond to one set of prescription. The most important need for Kashmir's struggle to succeed is a political platform without which no political party can attain its goals. Even the armed struggle is also carried on through a political platform and under the guidance of political leadership. We have never heard of political leadership aspiring to lead the national liberation war with bare two-week's training in the field. We have to take a lesson from history and history cannot be falsified. Those moving against the tide of time cannot reach their destination. Therefore the gun has to be used for the protection of political platform and Kashmiri masses have to be galvanised into civil disobedience movement. This is necessary for inculcating a sense of self reliance in the people. The power of making decision has to rest with the people alone. The world at large must know that the Kashmiri nations struggle peacefully for national liberation from a political platform. Today Indian forces make Kashmiris the target of their bullets even for negligible resistance like hurling a stray stone. But in a civil disobedience movement, retaliation by the armed forces for an incident of stone throwing will have more effect than a thousand martyrs laying down their lives. This is so because under international law, Indian forces will have no right to shoot at stone throwers, slogan raisers, strikers and protesters blocking roads. India would not be left with the option of tooth for a tooth or bullet for a bullet. There are innumerable ways of observing civil disobedience, strikes, traffic suspension, pen downs, boycott of Indian goods etc. That would deprive India of moral right of bullet for a bullet and at the same time hundreds of our young men, in the course of border crossing, would be saved from meaningless death. This would also save and protect the honour and modesty of our womenfolk. Above all this would win us the world opinion. These suggestions can be accepted only by such persons and groups as are operating inside Kashmir. I do not dole out this piece of advice to those who are fighting the war of others and under external instructions. I want to speak only to those who area committed to loyalty with Kashmiri nation. In particular, I address the Liberation Front which has been instrumental in placing the gun in the hands of Kashmiri youth in order to take away endemic fear from their minds. If the Liberation Front makes a dispassionate analysis, it will find that the gun cannot and has not guaranteed the freedom of Kashmiri nation. The Front is no more receiving the gun. Gun politics can in no way lead us to the destination we have set for our movement. Therefore the Liberation Front should initiate civil disobedience movement for the survival and freedom of Kashmiri nation. Because of our taking up the gun, the entire Indian nation has united to oppose our struggle. With reference to their relations with Pakistan, they find a rationale in opposing our armed movement. But in the wake of a civil disobedience movement, people within India dedicated to human values will voice their resentment against the oppression of Indian security forces. Apart from this, the members of minority community who had left the valley would also be induced to return to their homes. When they are convinced that the struggle is neither for religion nor for Pakistan but is a national liberation movement in letter and in spirit, they would also join it as nationalists. Political struggle will fill the vacuum created by 124 gun-wielding groups. It will also fill the gap created by giving divergent interpretations to the struggle and the sacrifices made by the Kashmiris. In a situation of political struggle, even ordinary persons will be able to express their views and he will also have the sense of participation in the movement. One important reason for the Americans to quit Vietnam was that the American public opinion considered American presence there as occupational. Fighting groups in Kashmir have described the masses of India as their enemies and in doing so they have not been able to convince them about their genuine rights, meaning the right to freedom. Civil disobedience movement will initiate political process. Through courts of law and through exerting peaceful political pressures, we can protect the rights of arrested freedom fighters who are at the moment languishing in Indian jails and incarceration camps. It has to be remembered that protection of 50 or 60 arrested mujahids facing charges of murder cannot be possible without a political platform. Even the decision of launching civil disobedience is by no means an ordinary decision. But people dedicated to the cause of the national cause surrender to no distraction, and take the crucial decisions conducive to their attainment of the goals. This will be a crucial and a hard decision. Either the people linked with ISI across the border or those in POK who sadistically watch the falling corpses of Kashmiri youth and molestation of Kashmiri women, will work as obstructionists in civil disobedience programme. It is so because they derive their sustenance from keeping the pot boiling in Kashmir. The people in Kashmir should have no confusion in realising that politicians in AK have no concern for the freedom of Kashmiris. They just want to keep the pot boiling so that they are able to achieve some mundane benefits for themselves. The same is true of AK people living abroad. Except for a handful of them, the rest are busy with their own affairs while AK politicians collect donations from the people to fill their coffers.. If Kashmir reverts to civil disobedience, they, too, will have to close their shops. International organizations invariably ask one question in connection with the freedom struggle of Kashmir. The question is: if you are fighting a national liberation war in Kashmir then why don't you come out on streets against Pakistan? Why don't you launch anti-Pakistan movement in AK? As long as intensive struggle for freedom does not take place in both the parts of Kashmir, the issue will not receive attention of public opinion on international level. International opinion is to be built through the video cameras. I must tell my readers that if Azam Inquilabi and Liberation Front do not even now organise a political platform and launch a civil disobedience movement ( as they are more knowledgeable than I am) then this movement is bound to meet a disastrous end. It could lead to a destructive war between India and Pakistan which might consume millions of people in the subcontinent. The question is will the pro-Pak accessionists, who would be responsible for igniting the flames of Indo-Pak war, remain faithful to Pakistan in case the war proves destructive for that country? Frankly speaking, they will not. And what will the Kashmiris get out of that situation? There may be another Tashkent or Shimla Agreement and both the countries will find their economies in shambles. Kashmiri nation should never allow their struggle for national liberation to become the cause of a self-destructive war between India and Pakistan. This can be done only by forming a political platform to launch a civil disobedience movement for independence and sovereignty. In the case of a war between the two countries, the map of Kashmir may get further divided and Kashmiri nationalists will not be distributed into only two groups but in several of them. Indeed people on both sides having faith in Kashmir's integrity, and political workers and patriotic Kashmiris, should break the fetters of political expediency, bid farewell to fear and timidity, sacrifice their petty interests for a larger national interest, and perform their role for the freedom of Kashmir. If they fail to do so, history will not spare them. People in Kashmir are still willing to make all sacrifices for the success of freedom struggle but they are fed up with 124 groups. They want to perform their full role in the freedom movement not through the use of gun but through political process. The aspirations of the masses have to be respected. The path along which the masses of people want to move is the only path which can successfully lead the movement to its destination.. If we fail to do that, history and our posterity will exhume our deeds and there will be no one from security forces to protect our graves.